Aurora News: The Empire Titans, when big isn't big enough! As with many things, the Jove Empire was among those who inspired the construction of the first Titans. Their Motherships with a length of about 4 kilometres were the first large ships the young factions came in contact with. 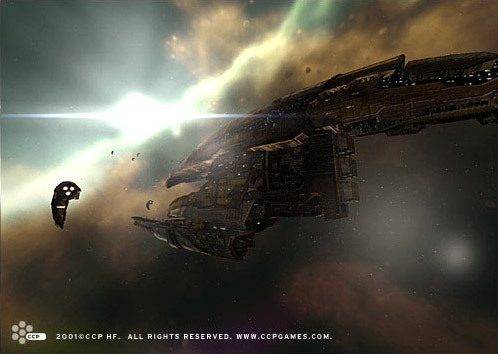 The Amarr Empire fought one of these weaponized Motherships during the Battle of Vak'Atioth. Originally, these Motherships were built as Worldships, meant to transport the Jove population to a safe region of space during their dark age. Originally they carried no weapons, the one the Amarr met was specially refitted with heavy duty energy weapons as counter to the slow Amarr Battleships during the engagement. However, the one ship that can lay claim to be the first titan is the Amarr Emperor Ship, to this day still the largest ship ever constructed! It was built to transport the Emperor of Amarr in near complete safety across space. Created during the glory days of the Amarr Empire, this ship has enough armor, shielding & firepower to demolish entire fleets by itself. Despite that the Empire Ship is centuries old, it is still the most powerful ship today, thanks to continuous upgrades & retrofits to its defensive & offensive capacities. From these two examples, the first Empire Titans were build, collectively known as the 'Iapetan' Titans or Large Titans. These titans are colossal in size, requiring the resources of an entire moon to be built and their sheer size gives them a noticeable gravity well of their own, requiring special navigational computers to include their mass effects on flight routes. Over the years, each faction built their own Iapetan Titans in order to turn the tide of war or to have an answer ready for the opponents Iapetan Titan. These massive starships functioned as mobile command stations, capable of directing & bridging large fleets across their territories for a rapid response to threats. In case of attack, their heavy defenses combined with formidable offensive capacities meant that any fleet attacking one needed a Titan of their own to cut down on losses. These massive ships usually function as their nation's flagships as well, due to their tactical importance as well as sheer intimidation factor. These are the Amarr Empire Titans, the name 'Imud Hubrau' translates into 'Beast of Heaven', due to their imposing size and the fear they instill in the Empire's enemies. This is also the only class of Iapetus Titans that has two different variants! Only two of the original Imud Hubrau Titans have been built. During the Khanid Secession, Khanid II managed to steal one of these two titans. Thankfully, due to the turmoil caused by the Amarr Succession Ritual, he managed to keep the titan and it was one of the tools used to consolidate his power & establish the Khanid Kingdom as a sovereign state. 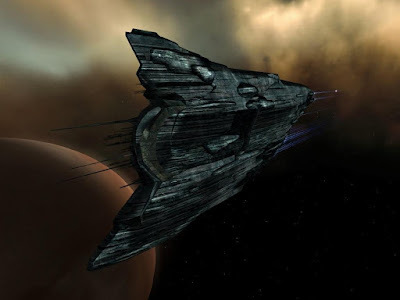 After the theft of one of the original Imud Hubrau Titans by King Khanid II, the Empire ordered the construction of new Empire Titans, but using the latest in ship technology. This resulted in a new shape for these colossal Amarr titans, a shape we today recognize. This second generation Imud Hubrau Titan would be the predecessor of the much smaller Avatar Titan! 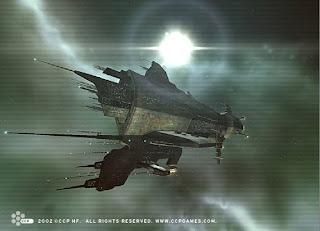 As a last note, while Amarr propaganda insists that the Emperor ship is more impressive & glorious in size & abilities, it is suspected by others that it is just the first of the Imud Hubrau Titans, modified to make sure it is the most powerful ship in the known universe, in order to allow the Emperor/Empress fight & coordinate battles in relative security. Don't be fooled by the name, this is actually the name of the Minmatar Iapetan Titan! Little is known about it, but it's suspected the first ones were built by the Thukker tribe as giant mobile cities, to accommodate their nomadic lifestyle in space. With that in mind, they are the bigger cousin of the Jovian Motherships who served as worldships for the Jovians. Not much is known about these titans, some suspect that the Elder Fleet used these titans to bridge in their massive capital fleet during their invasion of Amarr space to free the Starkmanir tribe that culminated into the Battle of Mekhios. It is known that the Gallente shared Iapetan Titan technology with the Minmatar Republic. As they found the drain on resources too hard to bear, the Minmatar were among the first to spearhead research into more compact Titans that exhibit similar logistic capacities & firepower as the Empire Titans. It never came to be this ultimate weapon, as Caldari spies learned of its construction, and in response the young State built their own Iapetan titans in response. Of all the Iapetan Titans, the Soltueurs are the most known, due to a very embarrassing incident that turned the Federation into the laughingstock of the Eden cluster for a time. This incident was namely the theft of one of these colossal starships by the Serpentis pirates in YC 107! 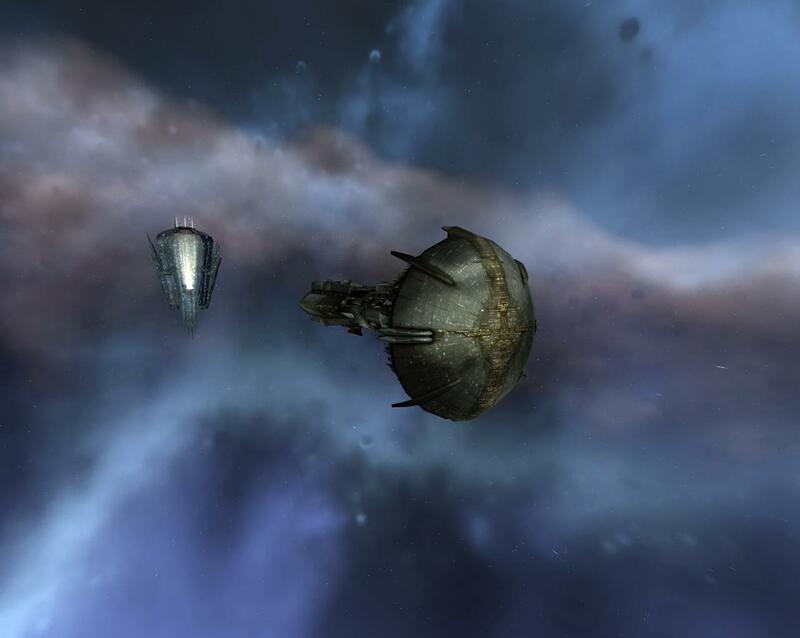 During a routine check, the Serpentis managed to infiltrate & take-over the Soltueur Titan FNS Molyneux. 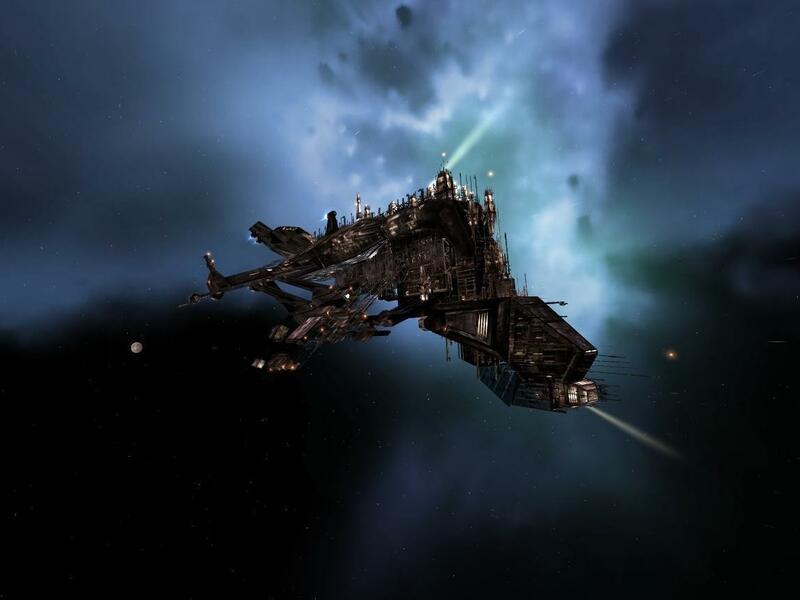 To complete the embarrassment, the Serpentis managed to get away with it, flying a colossal starship across space to the safety of Serpentis Prime. This event became known as the Flight of the Molyneux. The capsuleer Trooper B99 made an excellent summary on it years ago: Serpentis Titan Theft Story. 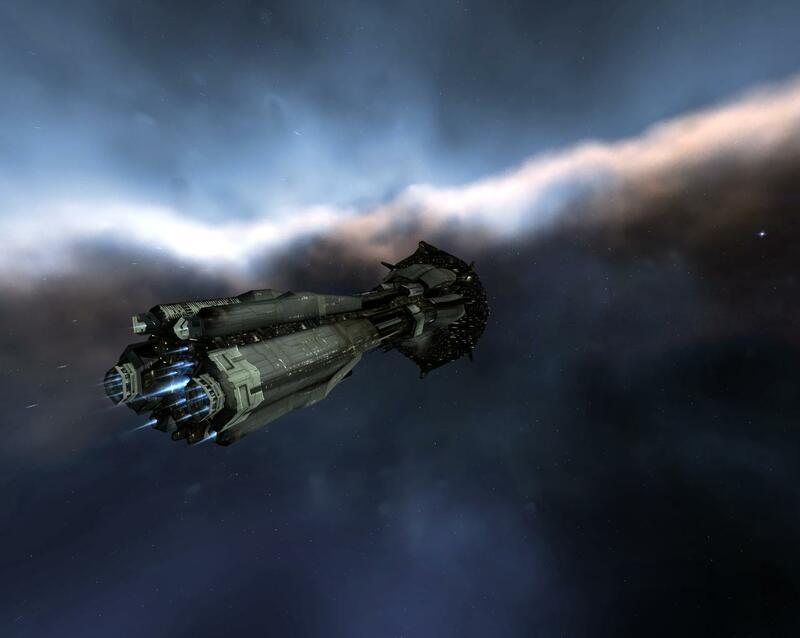 Current status of this stolen Soltueur is unknown, the Serpentis haven't used it so far. Chances are that it's used for research & engineering purposes. Recently uncovered data shows the Federation was planning to go all-out on the Caldari Prime battle, keeping all their Soltueur Titans ready to jump in for fire support as a last resort... Luckily it never came to this! This is the Caldari answer to the Soltueur. Very little is known about it, save that it was fitted with extremely destructive short range weapons. This loadout suggest they have been designed around the concept of a hotdrop; jump into the heart of an enemy fleet and rain destruction upon them. Of all the Iapetan Titans, the least is known about the Caldari variant. Not even their name is a certainty! Considering the size and the large number of crew to man such a ship, this is a feat of its own and a testament to the effectiveness of Caldari counter-intelligence. In the end, these colossal Iapetan Titans proved to be too resource-intensive to be build & serviced in larger numbers. Each faction only has a handful at most, constantly keeping them updated through refits & updates on their systems. As the four factions researched ways to be able to field Jumpbridge technology & Doomsday weapons on a more compact ship, they eventually managed to develop a new class of much smaller titans who could do what they envisioned. These second generation titans are called the 'Promethean Titans'. They are smaller in size, required less resources & time to be built and could be fielded in greater numbers. The downside was that they are much weaker than the Iapetan Titans. This was seen as an acceptable drawback however, as the Promethean titans could be equipped with a Doomsday weapon for intimidation purposes & a jumpbridge in order to transport fleets rapidly across a nation's territory. Eventually, these are also the Titans that capsuleers are able to build & fly to maintain their superiority over others. The four Promethean Titans are: the Amarr Avatar Titan, the Minmatar Ragnarok Titan, the Gallente Erebus Titan and the Caldari Leviathan Titan. Both the four navies as the various capsuleer organisations can field dozens of these Titans, allowing them not only to set up a very expansive jumpbridge network, but also the ability to bring colossal firepower to the battlefield in no time, should it be required.